Experts at Malwarebytes have reported that the code for the recently discovered Flash zero-day flaw was added to the Fallout Exploit kit. Experts at Malwarebytes observed a new version of the Fallout Exploit kit that include the code to exploit a recently discovered Flash zero-day vulnerability. The Fallout Exploit kit was discovered at the end of August by the threat analyst nao_sec, at the time it was used to distribute the GandCrab ransomware and other malicious codes, including droppers and potentially unwanted programs (PUPs). The activity associated with the Fallout exploit kit was temporarily suspended in early January, likely to improve it, in the same period experts at Malwarebytes observed an increase in the RIG EK activity. The Fallout EK was distributed mainly via malvertising chains, starting January 15 it was used to deliver the GandCrab ransomware. “After a short hiatus in early January, the Fallout exploit kit is back in business again with some new features for the new year.” reads the post published by Malwarebytes. The CVE-2018-15982 flaw is a critical use-after-free bug that was exploited by an advanced persistent threat actor in attacks aimed at a healthcare organization associated with the Russian presidential administration. The first exploit kit that integrated the code to trigger the CVE-2018-15982 flaw in mid-December was Underminer. 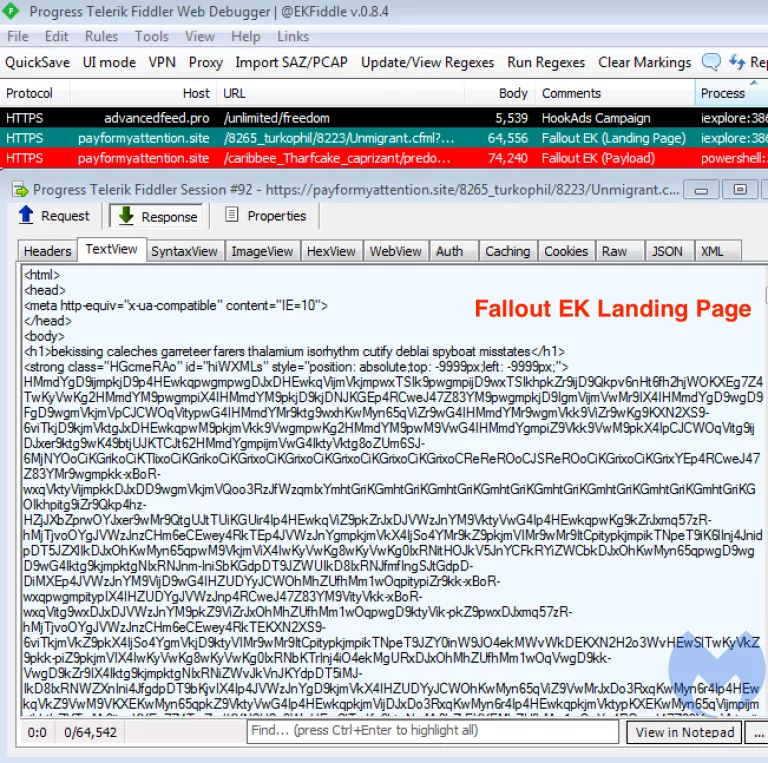 The new Fallout Exploit kit implements the support for HTTPS support, a new landing page format, and uses Powershell to run the final payload. This development is the proof that exploit kit developers are continuously improving their code to trigger the most recent flaws.